This tutorial provides you with a foundation for working with Adobe Dreamweaver features. It is the first lesson in the Adobe Dreamweaver CS5 Digital Classroom book. For more Adobe Dreamweaver training options, visit AGI’s Dreamweaver Classes. Whether you are a novice web designer or an experienced developer, Dreamweaver is a comprehensive tool you can use for site design, layout, and management. In this lesson, you’ll take a tour of Dreamweaver’s key features and get a better understanding of how web pages work. You will work with several files from the dw01lessons folder in this lesson. Make sure that you have loaded the dwlessons folder onto your hard drive from the supplied DVD. See “Loading lesson files” in the Starting Up section of this book. Note: If you want to get started creating a page, jump ahead to “Tag structure and attributes” later on in this lesson. Otherwise, the next few pages provide you with an overview of key capabilities and features of Dreamweaver CS5. Dreamweaver is an excellent coding and development tool for new and experienced users alike, and it has quickly become the preferred website creation and management program, providing a creative environment for designers. Whether you design websites, develop mobile phone content, or script complex server-side applications, Dreamweaver has something to offer. 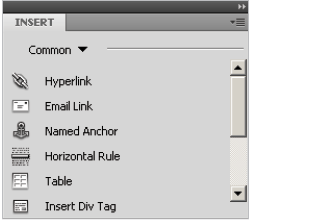 Dreamweaver’s many icon-driven menus and detailed panels make it easy to insert and format text, images, and media (such as video files and Flash movies). This means that you can create great-looking and functional web pages without knowing a single line of code—Dreamweaver takes care of building the code behind the scenes for you. Dreamweaver does not create graphics from scratch; instead, it is fully integrated with Adobe Photoshop CS5, so you can import and adjust graphics from within the application. you easily add images, web forms, and media to your page. Dreamweaver has everything you need for complete site management, including built-in file transfer protocol (FTP) capabilities between a server and your local machine, reusable objects (such as page templates and library items), and several safety mechanisms (such as link checkers and site reports) so that you can ensure that your site works well and looks good. If you’re designing your pages with Cascading Style Sheets (CSS), the Browser Compatibility Check and CSS Advisor features will help you to locate and troubleshoot any potential display issues that may occur across different web browsers. Dreamweaver lets you work in a code-only view of your document that acts as a powerful text editor. Edit HTML code directly and switch views to see the results of your code as you work. Features such as color-coding, indentation, and visual aids make Dreamweaver a perfect text editing or coding environment for web designers of any level. Code view is a full-featured text editor that color-codes tags and scripts for editing that’s easier to decipher.